Our global society and hectic lifestyles have contributed greatly to the save-the-date phenomenon. 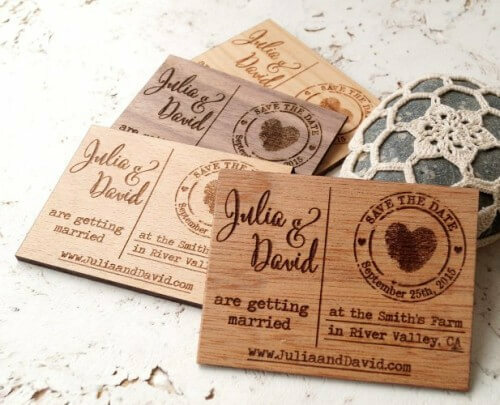 Now, it is almost uncommon to find a wedding where the bride and groom didn’t send out save-the-date cards in advance of the big day. Since they are so ubiquitous now, how can you make yours stand out amongst a sea of “We’re getting married” cards? 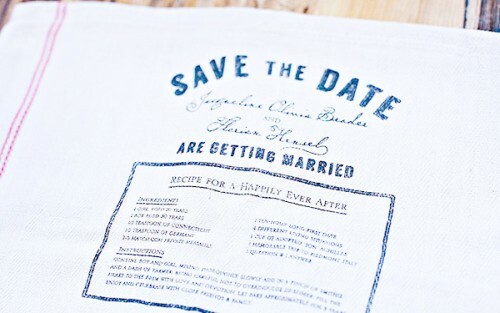 Everyone needs tea towels, therefore why not give your guests a useful save the date that they can’t miss? Give them a tea towel with your names, wedding date and location embroidered on the fabric to transform it into a quick and easy reminder. A big drawback to traditional wedding save the dates is that they get lost or thrown away very quickly. Well, now you can help your guests memorize your date without adding to the clutter in their homes. Simply put all of your wedding’s pertinent details on a magnet and voila, your work is done. There are never enough magnets to go around in a household. Below's a lovely example of handmade, personalized wooden magnets. You can get a set of 25 magnets for $50 at Amazon. Balloons are fun and bring out the kid in all of us. We suggest that you tap into your inner child for this idea. Attach a balloon to a card and then mail it out. 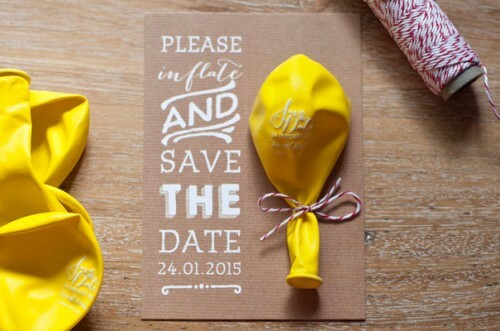 When your guests blow up the balloon, they will see the details for your upcoming wedding. Tip: Blowing up a balloon is actually not that easy. You can be extra nice to your guests by printing out these tips about blowing up balloons like a pro and send them along. We live in the digital age thus we should send out cards that take advantage of this age. By creating animated save the dates your guests can access your wedding’s details at the touch of their fingertips. This is the perfect reminder for tech savvy and whimsical couples. We love it when couples showcase their personalities while planning their weddings. These unique save the date ideas allow couples to set the tone for their wedding while retaining their individuality. Responding to an RSVP has never looked cooler. Thanks to SimplyBridal.com for sharing this guest article with our readers. SimplyBridal.com is an online retailer of wedding gowns, bridesmaid dresses, and bridal accessories. Based in Los Angeles, California, we now ship to 25 countries in North America, Europe, and Asia Pacific.